If you are interested in watching as I talk through my thought process during a Best Ball draft on Draft.com, follow me on twitter at @Rikleen where I will be posting links to videos taking you step-by-step and (web)page-by-(web)page through my drafting process. Thanks be to Draft.com, for delivering the wishes of legions of fantasy basketballers. At long last, there is a site for easily playing basketball Best Ball. The new Best Ball games were announced mid-season, which opens up some interesting strategic opportunities that wouldn't be available for the full-season version of the game. So, let's explore how to maximize those openings. Warning: this article gets a little long. There's a lot to unpack here. But the best value comes at the end, so it's worth it to stick it out. Back up. What's Best Ball? Rule Number 1 for all fantasy sports: Know your league settings. Therefore, you should read this even if you think it will just be a recap. Best Ball is the actualization of the one thing the entire sports world agrees upon: The fantasy draft is the best and most important part of fantasy sports. Best Ball is a draft-only fantasy league. The entire focus of the league is on the draft. There is no in-season roster movement. No trades. No waivers. No free agency. Once the draft is over, there is nothing left to do – unless you include compulsively checking your lineup and the box scores to see how your teams are doing. So how does scoring work? That's where Best Ball gets interesting, and that's where we'll find our strategic advantages. For Draft's Best Ball leagues, managers will select a squad of 16 players, but only eight will count in any given week. At the end of the week, Draft will automatically calculate your starting lineup from the top players at each position – three guards, three forwards, one center, and one "FLEX" for your highest scoring remaining player. The remaining eight players are irrelevant for that week. Only your best players count. You do not pick your starters at the beginning of the week. At the end of the season, the lineup with the most total points wins. That's all there is to it. Easy enough. Why is the mid-season start important? Over a full season, every team plays 82 games. Detailed schedule analysis can provide a small edge in a Best Ball format, but the season is long, and everyone plays the same number of games, so the schedules basically even out. But by starting in the middle of the year, Draft's Best Ball season starts when some teams have three or four more games remaining than others. So far this season, the Raptors' Serge Ibaka and the Heat's Josh Richardson have averaged almost the exact same fantasy points (FP) per game this season. Yet, in this Best Ball format, the Heat's 38 remaining games make Richardson a much more attractive pick than Ibaka, whose Raptors play only 34. - Half of each Fantasy roster goes unused each week. I'll spend some time getting into the significance of those below. OK, so, which teams have the best schedules? Good news: I have an answer. Bad news: It gets a little complicated. Short version: At different points in your draft, you're looking for different things in a schedule. For your first four to six picks, the schedule considerations are simple – the more games, the better. In the middle of the draft, it gets a little bit trickier. By the final few rounds, the potential value gained skyrockets, but managing schedule considerations gets significantly more complex. The reason that the value and strategy change throughout the draft is, fortunately, logical: your best players are the early draft picks, and they are so good that they will probably make it into your starting lineup (the top eight each week) every week, even if they only play two games. Since the winner of a Best Ball league is the team with the most total points at the end of the season, it doesn't matter when those points come, and you just want your best players to play the most games. The opposite is true for your last few picks. Your late picks are so much worse than the rest of your roster that they will be on the bench most weeks, regardless of games played. During this 10-week Best Ball season, you're probably lucky if your late-round pick cracks your starting lineup three or four times. So you'd still prefer a late-round pick to have more games remaining, but for these players you also care about how that schedule is broken down. You want a lot of 4-game weeks, and, specifically, you want 4-game weeks during weeks when most teams play fewer than that. During the week of January 28, NBA teams average 2.95 games, but two weeks later that average increases to 3.75 games. A four-game week is a lot more expected value added during the former example than the latter. You explained the reasoning and the overall strategy, but you still haven't told me what teams to target. Draft's Best Ball leagues are available in four-, six- and 10-player formats. The majority of leagues are 10-player, so that's what I'm going to focus on when talking about specific players. The teams I'm recommending, however, apply to all league sizes. Note: "Players to target", "undervalued players", and "overvalued players" are based on per game production so far this season and remaining schedule only – it does not account for projected development/decline, trade rumors, etc. Looking at the first rounds of drafts, right away we see players who should be moved up or down based on the schedule. In terms of per game averages, seven of this season's top-10 fantasy scorers play for one of the teams listed above. Joel Embiid, LeBron James and Kawhi Leonard all play for teams on the "avoid" or "aggressively avoid" list – and their current average draft positions (ADP) on Draft are fifth, sixth and 11th, respectively. At that draft price, managers should probably pass on all three, and instead focus on Paul George (8th in FP per game, 9th in ADP, Thunder a "target") or Nikola Jokic (11th, 12th, Nuggets a "target"). For first round picks like Embiid, James, or Leonard, the difference in games played is usually the equivalent of between one and three picks. Let's use Embiid, who is averaging 52.3 FP per game this season, as an example. If no one misses a game due to injury, that's the equivalent of 49.5 FP over 37 games, or 48.2 FP over 38 games. That means Embiid's schedule is the equivalent of dropping him from fifth in FP per game to sixth or seventh, respectively. If we assume every NBA player will miss exactly two games, then Embiid's FP per game would fall to the equivalent of ninth overall. That drop-off gets magnified in the next couple rounds. Eric Bledsoe is averaging 31.7 FP, which would have him as the last pick in the sixth round if it weren't for schedule considerations. However, since the Bucks play the 37 games, that's the equivalent of 34.5 FP for someone with 34 games remaining – the equivalent of jumping Bledsoe from 60th to 44th overall. Based only on per-game production, Bledsoe ranks almost twenty spots below Aldridge or Ayton, but after factoring in their schedules, the three players are on pace to produce almost identical fantasy totals during the Best Ball season. Realistically, after the first couple of rounds, the best picks aren't going to be the ones who gain an advantage from their schedule. The top values are going to be the players who make significant improvements in their per-game production. However, anticipating which players will make that leap is a topic for an entirely different article, and the importance of that task doesn't nullify the importance of maximizing your scheduling advantage. Whether or not you find a second-half break-out star, your team will have a better chance of winning if it plays more games than your opponents. Second, the players in this range of the draft are the ones most likely to elevate into the level of an every-week starter – in which case you want to maximize their games, since more games will mean more points. The players in these rounds are likely to make your starting lineup frequently – hopefully one or two of them will make your starting lineup every week. But it's important to remember two things about this range of the draft: First, you do not expect all of these players to start every week; second, the difference between the 50th overall player and the 100th player is just 6.0 FP per game. Four games of the 100th-best player (Thad Young, 26.7 FP per game, 106.8 FP) outscores three games of the 50th-best player (Jamal Murray, 32.7 FP per game, 98.1 FP). Therefore, the strategy in these rounds has to be more than just "target the players with the most games". We still want to maximize games remaining, in case our picks elevate into every-week starters, but it is more important to target the players with the most four-game weeks. The Wizards and the Bucks both have 37 games during the Best Ball season, but the Wizards have six four-game weeks while the Bucks only have five. For that reason, the Wizards are a better team to target during these rounds than the Bucks. That said, all else being equal, we'd still prefer a Knick to a Wizard in this section of the draft, as the Knicks also have six four-game weeks, but they have an extra game overall. During the first nine weeks of the 10-week Best Ball season, all teams play between one and five games per week. Only one team, the Trail Blazers, has a one-game week. Only two teams, the Knicks and the Warriors, have a five-game week. Everything else is a two-, three-, or four- game week. What Draft is calling Week 10 is actually the last two weeks of the season, during which teams play four, five, or six games. For the purposes of the chart below: the Knicks' and Warriors' five-game weeks are being counted as four-game weeks; playing six games in Week 10 is being counted as a four-game week. Here's where things get fun. Remember: First, we expect these players to be on our bench most weeks; second, the difference between players shrinks the later we get in drafts. Earlier we mentioned that 6.0 FP per game separated the 50th best producer from the 100th. The difference between Player 100 and Player 150? 4.8 FP per game. That tells us two things. First, it tells us that we're not drafting these players for their every-week production, we're only interested in their best weeks of production. Second, it tells us that we can allow the schedule to play a much bigger role in who we select, because the per game difference is constantly shrinking. I'm about to provide a whole chart on how all 30 NBA teams' schedules rank based on a metric I created specifically for this season of Draft's Best Ball leagues. But, honestly, you should only be using the top half of it. Maybe the top-two thirds. At this point in your draft, there are only two good reasons to pick someone who does not have an advantageous schedule – either you are picking someone you expect to breakout and significantly improve over the final three months of the season, or you should be strengthening a position you are very week in. In these rounds, breakouts, positional need, and schedules are the only reasons to pick a player. Back to that chart I mentioned. Most weeks, for these late picks to crack our starting lineup, either things went very wrong for our earlier picks, or things went very right for our late round guy. For these players, simply counting four-game weeks isn't enough. 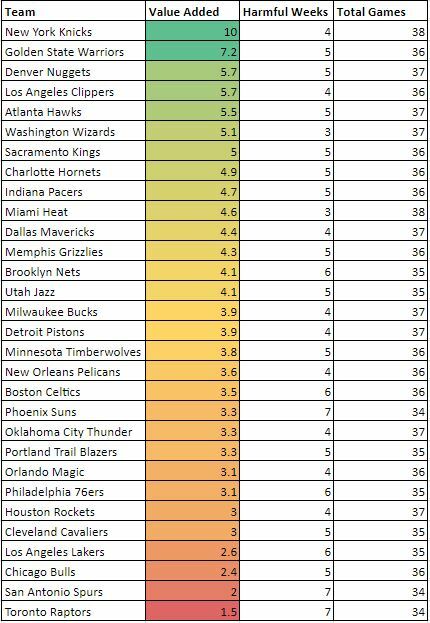 In Week 4, NBA teams average 3.75 games. Only six teams don't have a four-game week – and that includes the Knicks, who have a five-game week. A four-game week in Week 4 probably won't be enough to get these late-round guys into your starting lineup. On the other hand, in Week 2, when teams average 2.95 games, the nine teams with a four-game week provide a massive advantage. Not all four-game weeks are created equal. The chart also includes the number of "harmful weeks". A harmful week is defined as a week when the team plays fewer than the league average number of games that week. This column is primarily relevant for managers who are trying to sure up a weak position in the later round. Otherwise, it is not nearly as important as the Value Added column. Note 1: The quantities are to demonstrate the degree of difference between teams. They were normalized to give the Knicks, who have the best schedule, a "perfect 10", and all other scores were scaled accordingly. the Knicks add roughly twice as much value as the Kings, and the Kings add roughly twice as much value as the Lakers.